The following shows an example of how a flexagon can change as a result of the pyramid shuffle flex. 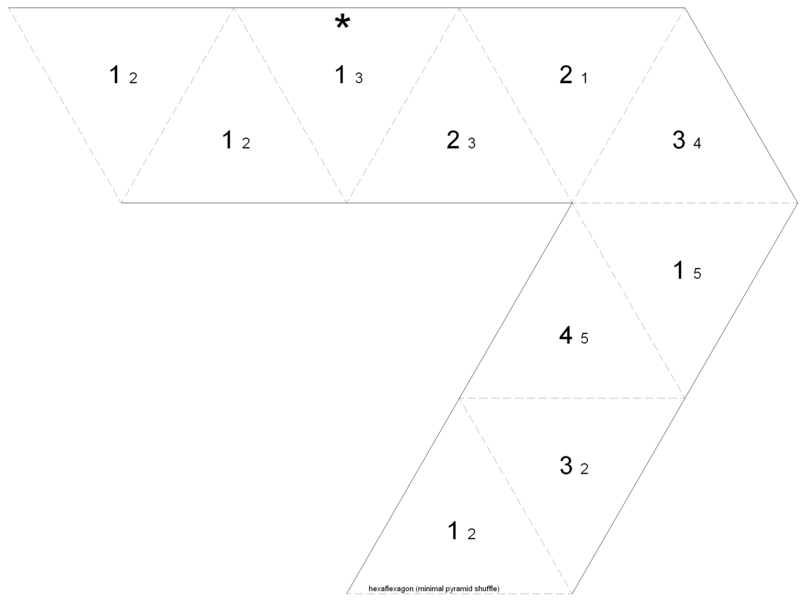 To describe it, I'll use the 5-sided hexaflexagon posted at braids as reference, though this will work on many others. It can be applied when you're looking at side 0 with either side 1 or 4 on the back, but this description will assume 1 is on the back. In this state, the pats (stacks of triangles) will alternate between having 4 leaves in them and a single leaf. Take a 4 leaf pat and fold the back of it against the single leaf pat immediately counterclockwise from it. This should allow you to open up a pyramid from the center of the flexagon. You should see four 2's on the inside of the pyramid. Keep pulling the tip of this pyramid out till it lies flat on its side. The flexagon should now look like a pyramid with an extra triangle sticking off it and 1's on the inside. The pyramid of 2's that you just flattened should open up from the opposite side you just closed, revealing 3's. However, you want to open it up on the inside of the pyramid of 1's so its inside will have a pair of 3's and a pair of 2's. Open it up as far as it will go. Now push the tip by the pair of 3's down into the pyramid of 1's and 2's. This step requires a little bending on a hexaflexagon. At this point, you should be able to open it all back up to a hexagon, with four 0's and two 4's on one side and four 1's and two 0's on the other. You can pinch flex from here, revealing several mixed up faces. Note that you can chain these flexes together if you skip the final step of opening the pyramid up flat. On an even ordered flexagon (e.g. an octaflexagon but not a heptaflexagon), this will eventually move everything on the front to the back and put a new side on the front, being the equivalent of a series of pinch flexes. 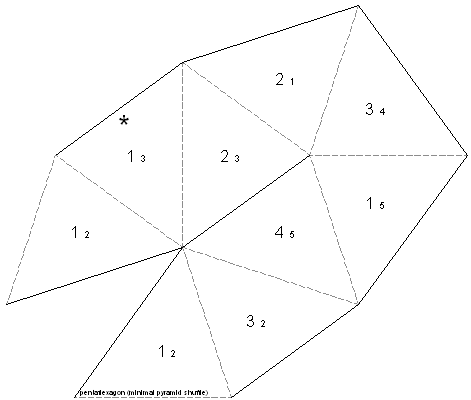 An example of doing the pyramid shuffle on a 5-sided hexaflexagon. When finished, the flexagon will look like this. The following strip is for the simplest possible flexagon that supports the pyramid shuffle. 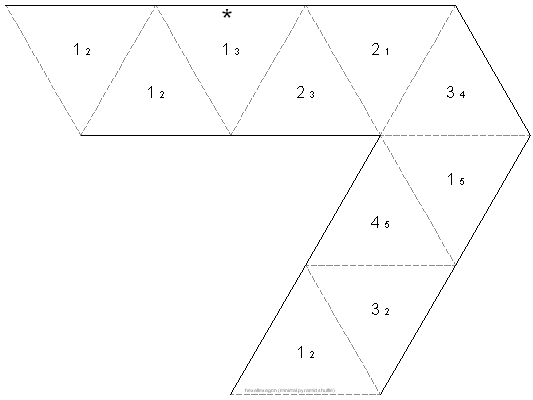 It requires 9 leaves and 5 pats, so the simplest flexagon is a triangle pentaflexagon. Click on the thumbnail to get the full sized version. Cut along the black lines and copy the small numbers onto the back faces. Fold the adjacent pair of 5's together, the adjacent 4's together, then the adjacent pairs of 3's together. Tape together the two triangle edges with the dashed lines to make a pentagon. The * on side 1 shows you were to start the flex. With side 1 facing you, fold backward along the edge with the *. You should then be able to open the flexagon up from the center to reveal four 3's. Following the directions above should give you a pentagon with three 1's and two 5's on one side and three 2's and two 1's on the other. 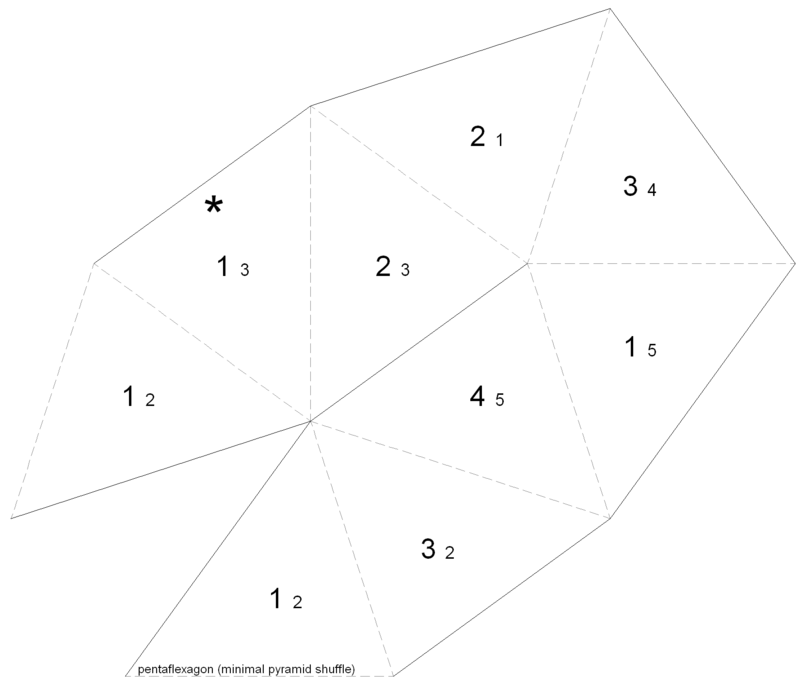 Below is the simplest hexaflexagon that supports the pyramid shuffle. It requires 10 leaves.